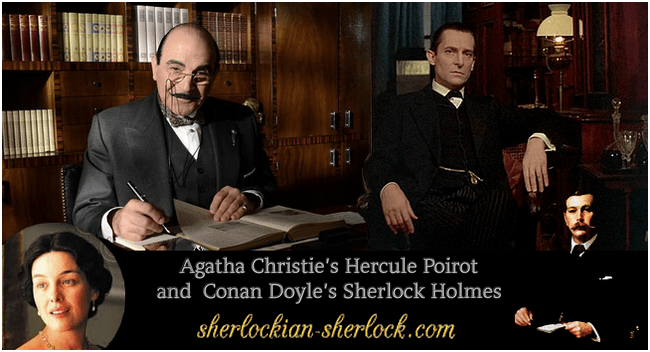 Hercule Poirot or Sherlock Holmes: which one is more famous? Who is the world's best detective? For many Hercule Poirot is the king of detectives, he is the best and they can’t understand why others say the same about his predecessor who lived at Baker Street. In fact the title is due only to Sherlock Holmes, but we have to deal with this phenomenon a little more extensively. Let’s find out the reasons together – of course with paying tribute to both detective geniuses. The adventures of the Belgian sleuth are rightly among the gems of detective mystery. Though Agatha Christie made some mistakes (for example, she didn’t age her hero for a while – Poirot was ageless for a long time, but Conan Doyle never made this failure), her stories were fantastic, chilling, plain, spiced up with subtle humour and having some morals as well. These features were typical for the adventures penned by the Scottish author as well, but Agatha’s style was a little simpler (she repeated lots of words). That is why her stories were more easily understandable for not too literated people. We also have to take into consideration that when her books were published, women already had the opportunity to learn and they had time to read too – so she could reach a broader public. It contributes to the recent day popularity of Poirot that between 1989 and 2013 there was a great tv series about his investigations starring the exceptional David Suchet. This adaptation was quite faithful to the original, but without doubt Mr. Suchet’s wonderful, heroic portrayal truly impressed the viewers. The lovely David gifted us with unforgettable hours for long years, in 70 episodes. The series is very popular and well-known, and it surely will entertain many generations (I will always be thankful for the kind David Suchet, because his compelling acting made me love detective stories and books. He brought lots of miracles to my life.). But fate was hard on Sherlock Holmes. Countless books, theatre plays and television adaptations were born that were totally different from Doyle’s stories, the only common thing in them was the name of the sleuth – and many of these were just awfully boring or unenjoyable. These may deter someone from the character forever. At the same time there was the unsurpassable Jeremy Brett, who was a phenomenal actor, just like David Suchet. He devotedly portrayed Sherlock. But unfortunately his illness had its effect on the series, he was so unwell that he cannot prevent changes in the screenplays. Eventually his death made the finishing of the series impossible – originally they wanted to adapt all adventures on screen. Beyond dispute this unfinished show is a unique, outstanding work. „I have no doubt that few performances in the history of television drama were as perfect, passionate, exquisitely realised and definitively delivered as that of Jeremy Brett’s extraordinary Sherlock Holmes” – told Stephen Fry, British writer, actor, humorist and filmmaker. Sadly because of the death of Jeremy Brett we can only enjoy 41 episodes, not the whole Canon. 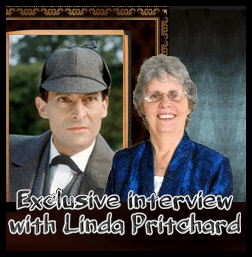 After Jeremy Brett there was a break of continuity….. for a long time. Maybe fate paid tribute to the wonderful actor with this silent mourning, to the artist whose heroic performance had not been acknowledged in the form of an award while he was still alive. Many viewers felt that his followers in the role were weak or not convincing, because Brett set the standard so high. The effects of the earlier adaptations tarnished as well. Series starring Basil Rathbone or Peter Cushing appeared rarely in the programmes, because they were held out of date. Though there was a brilliant Russian series with the superb Vasily Livanov, sadly this was not shown in many countries, or aired only once – this is a real tragedy. 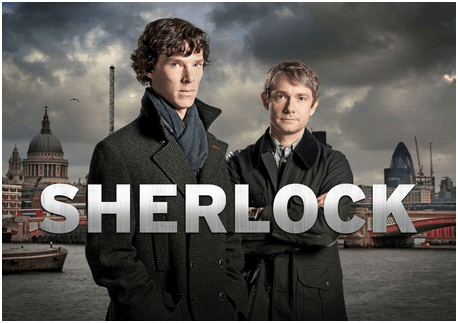 Finally the detective became popular again thanks to the modern adaptations – Guy Ritchie’s movies starring Robert Downey, Jr., BBC’s Sherlock with Benedict Cumberbatch and CBS’s Elementary with Jonny Lee Miller as the main character. It is important to point out that these new versions differ greatly from the original stories of Conan Doyle, and the adoration that follows is often directed towards the charming actors, not the eccentric detective genius or his method of crime solving. Writing fanfiction and making videos and pictures is a way of artistic self-expression, which is also very tempting. We will soon return to the famous sleuths, but we have to note that BBC was clever and professional enough to clutter up the episodes with objects, symbols and quotes that were easy to remember – yet this was knowingly manipulative at the same time. Such a thing was the yellow smiley on the wallpaper, Sherlock’s scarf, the IOU, the phrase „I am Sherlocked” and so on. These all inspired many fanart. Creating something makes us feel ourselves more valuable – and fans felt they own the series even more. We can say that this modern-day jonesing goes largely for the charisma of Benedict Cumberbatch and Martin Freeman and for the online creativity, not for the character of Sherlock Holmes. Because of the aforementioned reasons Poirot may have some advantage regarding those who did not read the books on which the series were based. That time is soon over when, in 1893, people in Great Britain and in the United States mourned the loss of Sherlock Holmes with black crepes and death-marches. Namely Conan Doyle wanted to concentrate on his other literary works, so he killed his hero at Reichenbach Falls – and later „resurrected” him under public pressure. Readers joined with in an age when there were no mobile phones and internet, they sent handwritten letters of complaint because of the death of their favourite detective. Most people were stunned after reading The Final Problem, and they experienced that many others shared their emotions. People who didn’t even greet each other before began to talk about the tragic loss of a beloved genius. Strangers realized that a common passion connects them – the fact that they like the eccentric tenant of Baker Street. A coalition came into life, and people agreed that they have to do something to change the situation. They succeeded. Reading the adventures of Holmes they learned nothing is impossible, it is always worth to fight for our goals. They struggled just like Doyle’s hero. Sherlock Holmes gave them hope and the freedom of thinking. Even the most simple-minded workmen sized up no one can deprive them from their joys if they are brave enough to stand up for them, just like their role model. Undoubtedly there were numerous threatening letters, but the majority of the people found a nonviolent and tricky way of protesting which was worthy of Sherlock, the man of spirit: more than 20000 people deleted their The Strand Magazine subscriptions, because there were no more Holmes adventures in the paper. Arthur Conan Doyle gave in and brought back his most famous hero. We can say that Sherlock had a real effect. He jumped off the printed page and found his home in the heart of his fans. Hercule Poirot was able to do the latter as well, but his fans never protested for him at his author. Sherlock Holmes has an even more significant effect. The things he taught about thinking impressed a French man called Edmond Locard. Later he got the nickname „the French Sherlock Holmes” and practical criminal investigation was born thanks to him. Dr. Locard set the British sleuth as the best example of the perfect investigator in front of his students. While solving his own cases he reclined upon the methods of Holmes. Conan Doyle began to write his own mysteries because he was annoyed that fictional detectives solved their cases mostly because of luck. It is true that at the beginning his creatures had another names, but one thing was sure: that reason and scientific facts must be the policy. During his university years this became his firm belief when he studied under the guidance of dr. Joseph Bell, who was excellent at deduction and sometimes he helped the work of the police. So Conan’s detective used several branches of science to solve mysteries, and he created a new one: forensic science. Doyle put down the basics, Edmond Locard learned these, put them into practise and improved them with his own knowledge. Though there were some initiatives earlier by the police, but at that time investigations weren’t based on evidence. Because of the lack of routine conclusions were wrong, and the police thought medical science is not important. Conan Doyle created efficient criminal investigation, and he was inspired by Edgar Allan Poe’s C. Auguste Dupin. Sherlock Holmes positively affected crime solving, while Agatha Christie’s Hercule Poirot had no such effect. There’s only a single fictional detective having the same merit, he is R. Austin Freeman’s dr. John Evelyn Thorndyke. But he could not impress people the same way as his Baker Street colleague did. Sherlock Holmes made the world a safer place and became a truly significant character. Hercule Poirot will always be an excellent private detective, but the world’s greatest detective, the real king of detectives is Sherlock Holmes. He’s the only whose name coalesced with the idea of the genius, just like Albert Einstein’s. Of course there are other great sleuths, but Sherlock is acknowledged all over the world. For the world him and the German scientist represent the highest degree of human spirit. Both the Belgian and the British detective became famous when there was no such massive advertising campaign behind them like nowadays behind a new book. Friends and relatives recommended them to their families, and their stories were impressive enough for success. People read them to each other and one could often see people sitting and reading their stories. They could learn moral lessons from the adventures and apply them in their life instead of quarreling, moping, drinking or burgling. Talking about the two fictional heroes became a regular activity among family members and friends. Fan clubs were founded where people could make acquaintances. Sherlock Holmes and Hercule Poirot have the effect of building a society. Fans can learn, feel that they are important and realize that they can make their life better with thinking. These two good-hearted, intelligent heroes are always with them, and they still teach how to handle conflicts and to avoid prejudices. As long as people live on Earth they will be loved, but we have to keep in mind that they are the results of the work and imagination of two wonderful people. Our deepest respect for Agatha Christie and Arthur Conan Doyle. Why Hercule Poirot would have not been able to catch the monster of Whitechapel?